Sudden tension on a tendon weakened by excessive or repetitive effort can cause it to tear completely and, if left unrepaired, can lead to significant weakness during daily movements like screwing. You don't necessarily have to lift something heavy to damage the biceps at the elbow level. 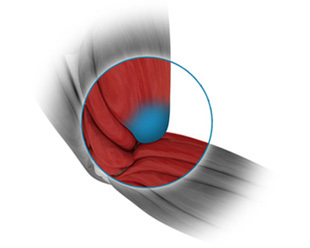 Complete rupture of the biceps tendon at the elbow requires immediate repair for active people. Late repair, over 4 to 6 weeks after the rupture, creates more complications. Partial rupture can also benefit from surgical repair (reinsertion of the distal biceps tendon to the tuberosity of the radius, using anchoring).